It has not been disclosed which molecules have been found, or how complex they are. He explained: “You can’t rule out rock, but if you look at the global story, we know the overall density of the comet is 0.4g/cubic cm. There’s no way the thing’s made of rock. 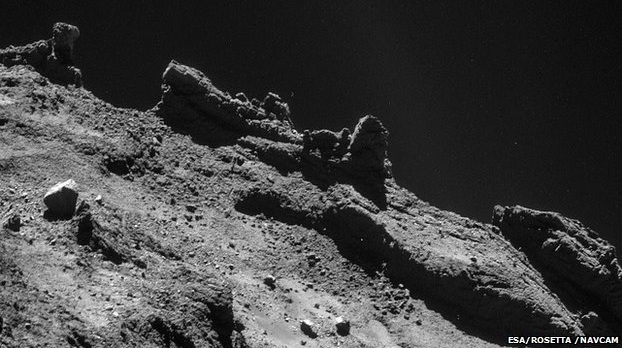 After bouncing off the surface at least twice, Philae came to a stop in some sort of high-walled trap. “The fact that we landed up against something may actually be in our favour. If we’d landed on the main surface, the dust layer may have been even thicker and it’s possible we might not have gone down [to the ice],” said Prof McCaughrean. Scientists had to race to perform as many key tests as they could before Philae’s battery life ran out at the weekend.